Adopting new technology for teaching has been one of my passions, and luckily my students have been understanding even during glitches or choices that turn out to be ineffective (such as the mobile/Internet voting technology that I wrote about last year). My goal has been to use technology to make my courses more interactive: I use clickers for in-class polling (to start discussions and assess understanding, not for grading! ); last year, after realizing that my students were constantly on Facebook, I finally opened a Facebook account and ran a closed FB group for out-of-class discussions; In my online courses on statistics.com I created interactive lessons (slides with media, quizzes, etc.) using Udutu.com. On the pedagogical side, I have tried to focus on hands-on learning: team projects took over exams, in-class presentations and homework that get your hands dirty. But all these were just baby steps, preparing me for the big leap. In the last month, I have been immersed in a complete transformation of one of my on-ground courses: The new approach is a combination of a new technology and a recent pedagogical movement. The pedagogical side is called 'flipping the classroom', where class time is not spent on one-directional lecturing but rather on discussions and other interactive activities. The technological leap is the move towards a Massive Open Online Course (MOOC) – but in my case a "moderate open online course". As a first step, the course will be open only to the community of the Indian School of Business (students, alumni, faculty and staff). The long term plan is to open it up globally. 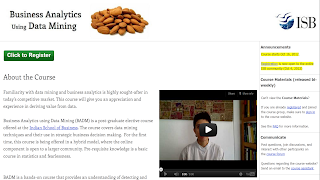 The course Business Analytics using Data Mining is opening in less than two weeks. I've been working round-the-clock creating content for the online and on-ground components, figuring out the right technologies that can support all the requirements, and collaborating with colleagues at CrowdANALYTIX and at Hansa Cequity to integrate large local datasets and a platform for running data mining contests into the course. You need strong support from the university! Luckily, ISB is a place that embraces innovation and is willing to evaluate cutting-edge teaching approaches. Hardware for lecture videos: Use a good webcam that also has a good mic. I learned that audio quality is the biggest reason for people to stop watching a video. Getting the Thimphu street dogs to stop barking is always a challenge. If you're in a power-outage prone area, make sure to get a back-up battery (UPS). Have several people go over the course platform to make sure that all the links work, the videos stream, etc. Also, get someone to assist with participants' technical queries. There are always those who need hand-holding. The way the course will work at ISB is that the ISB community can join the online component (lecture videos, guided reading, online forum, contests). Registered students will also attend on-ground meetings that will focus on discussions, project-based learning, and other interactive activities. We opened registration to the community today and there are already more than 200 registrants. I guess everyone is curious! Whether the transformation will be a huge success or will die out quietly is yet to be seen. But for sure, there will be insights and learning for all of us.